What is new in 2.3? Users can shortcut a file to anywhere they want in S-Drive. This place can be a folder in the same record, another record under the same object or a record under a different object. Shortcuts have zero bytes of size, enabling users to have the same file in multiple places without paying any extra storage costs. Note: Shortcuts are available in both Classic view and Lightning Experience, although they can only be created in Lightning Experience. REST API is now available for S-Drive. Newly implemented REST interface enables access to any software outside Salesforce. S-Drive users can now transfer files with ease between S-Drive on Salesforce and other third-party applications. 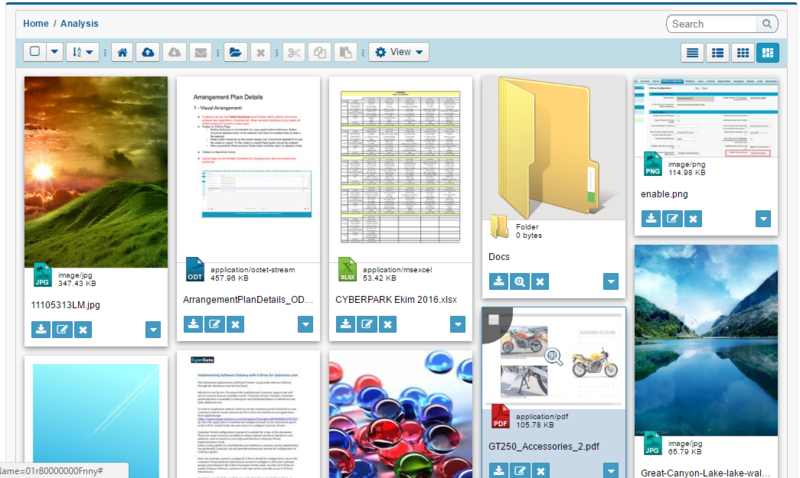 S-Drive users can now use the optional drag and drop functionality to upload their files easier. For more efficiency, there is also an auto upload option. When this option is enabled, there is no need to click on the Upload button for upload process to start, the process will automatically start. Note: Auto upload is disabled by default for current S-Drive users’ convenience, it can be enabled from S-Drive Configuration. Starting from version 2.3.1, S-Drive is a HIPAA compliant document management application. This means that S-Drive follows rules and regulations enforced by HIPAA and provides security to protect sensitive data. 2.2 Release turned out to be a release of All Clouds. We refer to All Clouds as Marketing Cloud, Sales Cloud, Service Cloud, Communities Cloud, Commerce Cloud and Connect Cloud. Marketing Cloud: Along with this release, we introduce HD-quality file previews and thumbnails. Sales Cloud: You can do lead conversion and carry over lead files to contact files, account files and/ or opportunity files, it is a matter of your choice. Service Cloud: We are introducing a free component for Case with Attachment(s). No more hassling with a tedious two-step process to create cases first and attach files second. 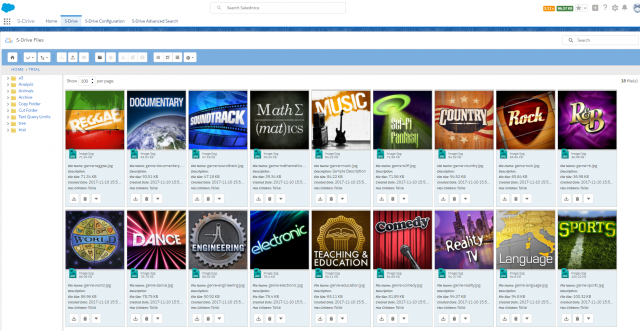 Communities Cloud: A truly desired feature ‘Folder-based Search’ is available now. This way, you can search with a keyword on a specific folder. Commerce Cloud: We are enabling S-Drive users to share public URLs with password protection. Users will not only be able to download but also be able to access files and folders even if they are not Salesforce users. Visit Installation Guide to configure S-Drive Lightning Component for Accounts, Cases, Opportunities and Contacts. Visit Advanced Configuration Guide to configure S-Drive Lightning Component for custom objects. Along with the 2.0 release S-Drive is now Lightning Ready. You can configure S-Drive Lightning Component for your standard/custom objects and S3Object(S-Drive Tab). Important Note: If you enable my domain after installing S-Drive 2.0, the S-Drive Tab which is placed into S-Drive App for Lightning Experience will not be visible. To make this tab visible, navigate to Setup–>Profiles–> Your Profile–> Tab Settings and then set S-Drive tab to “Default On”. This is a known issue of Salesforce. For further explanation, you can visit this link. You can see thumbnails of files scrolling the file list with three new list view type: Thumbnail, Grid & Card view. Also, without downloading the file, you can quickly look up file’s preview image and details by Preview Details Window. By renewed user friendly & modern look interface, you can easily find what you are looking for. Modernized Toolbars, new View Types, sensitive shortcut buttons, redesigned menus and flexible layout are developed to enhance your DAM experiment. Also, you can save your preferences (Sorting fields or View Type selection) to settings, in order to define default behaviour of the object you work on. You can select multi files & folders and download at once by HTML based Zip & Download Service with all browsers support. Service will create a zip file then immediately start to download. S-Drive does not support Java based Download Manager anymore. Now, you can add custom fields to S-Drive Folders, too.